"Middle Street, from Lime Street (Market Street), Looking East." Middle Street, from Lime Street (Market Street), Looking East. Middle Street, looking east from Lime Street (present-day Market Street). "Middle Street, from Lime Street (Market Street), Looking East." (1866). The Great Fire : 1866 - Stereoscopic views. 26. 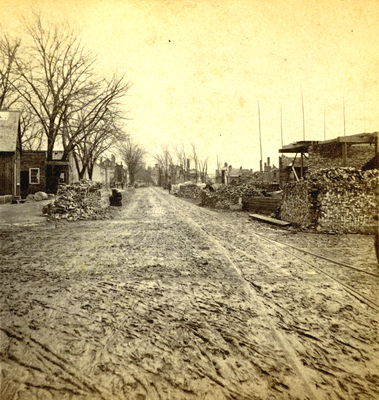 Portland, Me., Great Fire, Portland, Me., 1866, East End, Middle Street.